There is one thing I don’t quite like about a lot of WordPress theme developers: They try to put everything in a theme, thinking that their template will be adored by everyone. Unfortunately, there is no such thing as “one size fits all” kind of product. Some will love what you’re doing, others will hate it. That’s simply how life works. There is a balance. Having that in mind, today I’ll show you a theme that doesn’t have everything. Doesn’t have all the options. Still, it’s one of the best themes you can purchase today. No matter if you are new to the WordPress world or you have years of experience, chances are that you’ve probably heard about StudioPress and the Genesis Framework. The Genesis Framework is basically a WordPress theme, that’s fully optimized to make your site fast, SEO friendly, and allow you to present your content in the best possible way. Their portfolio includes a lot of themes but one of the best, in my opinion, is Authority Pro Theme. Today, in my detailed review, I’m going to show you how this theme will upgrade the looks of your WordPress site. WHO IS THIS THEME FOR? AND IS IT FOR YOU? As the name suggests, the theme whispers authority. It’s perfect for entrepreneurs and solo players who are building something all by themselves. If you’re a one man army and you want to create your own membership site, or become a guru in your niche, this theme is perfect for your needs. The theme supports WooCommerce in full. Meaning, you can easily sell your services to the people visiting your site. Not that it can’t be used by a corporate firm, but I think that it best fits single players who want to make a difference. Usually, you’ll download the .zip file of the theme and upload it inside the admin page of your WordPress. Not that here the case is a lot different, you simply need to do the process twice. The theme file. In our case, Authority Pro Theme. Authority Pro – Sub category. The following message will appear prompting you to install a child theme. Basically, a child theme is needed to make sure future changes to the CSS of the theme won’t be lost. So, simply repeat the process with the Authority Pro .zim file: Add new > Upload a theme > Choose file > Install now > Activate. The Authority Pro should be the one active. Are there Demos Included in Authority Pro? The short answer here is No. There aren’t any demos included in the theme. Basically, the theme itself, Authority Pro, is a demo of the Genesis framework. You’re buying a single theme layout when you’re buying Authority Pro. Well, you can buy all child themes but it will be a bit more expensive. More about the prices later though. So, before we check how our site looks, let’s go through the settings that are visible inside the admin section of your WordPress. Select site layout: This sets the global layout of the site but it’s also something you can later change. Set how your content will appear on the archives pages. It’s good to match the overall design with your site. In case you need to add header or footer script, you can do it from here. Save the changes and go to Genesis SEO settings. The Genesis Framework is famous for its SEO friendliness. Still, if you’re using SEO by Yoast you most probably won’t have to do anything on this page. When you access the SEO settings, you will see a short disclaimer on the top of the page suggesting that we should go to the Customizer panel. So, why not make the changes there. Simply click on the link on this page or, go to Appearance > Customize. Besides the awesome look, we can easily make the needed changes. You can change the separator to be something different than “–” and also consider if you want your domain to appear after the post title. I don’t personally suggest to check the last boxes. The authors of this theme suggest that you shoudn’t touch the settings inside here if you don’t really know what you’re doing or what type of tags you want to include in your document title. Simply, leave the settings as they are. Again, if you’re not sure what you’re doing, it’s best to leave the settings as they are. In general, you don’t need the above mentioned tags to be indexed by Google and the other search engines because this will lead to duplicate content. And Google doesn’t like duplicate content. You can also leave the other settings: archiving and directories, in their default configuration. Ok, we’re done with the initial settings, let’s now see what other options are included in this theme. My suggestion is to use all of the 3 options above. It’s really cool that this option is included inside the theme. You don’t have to install an additional plugin to add a banner, something that comes really handy when you’re running a promotion on your website. Again, settings here are quite straightforward: Choose do you want to have the top banner and what will be the text inside. Hero Portrait Section is the third tab inside the Authority Pro settings panel. This one is my favorite thing about the Authority Pro WordPress theme. Actually, this option is the main thing that differentiates this theme from all other themes. There is one more final option inside this main tab, Authority Pro Settings, it’s called Hero Logo Section. Basically, if your site is featured on other famous websites you can add the logos of these sites so people can see them. This will make you look more credible in the eyes of others. Voila, now it looks like I’m amazing and everyone wants to speak with me. Still, there are additional settings that will make your homepage even better. So how we can add that option? You need to first install the following plugin: Genesis eNews Extended. Go to plugins, Add new and search for this plugin. Once you find it simply install and activate the plugin. You will see that a couple of options are appearing. Depending on the company you use to store emails (I use MailChimp), you need to add appropriate action. I’ll suggest checking this tutorial here: link. Inside the Widget section, again, you can add really cool call to action banners to specific pages of your site. For example, if you want your visitors to first check your About page, you can add that right after your Hero Avatar. Are we going to show the featured image and what will be the size? What content to appear and etc. It looks amazing. Clean design that will lead the customer to where you want. I kind of adore the little arrow on the top. SEO settings for each post. You can add your meta description and etc. Still, I prefer using SEO plugin by Yoast. When you scroll a bit down you will see that there is also an option to change your layout for this specific post. This overwrites the global settings. Additionally, you will see a place where you can add header and body scripts. Not that many options but it’s basically everything you need for a WordPress blog. WHAT IS THE PRICE OF Authority Pro Theme? So, what’s the price, right? 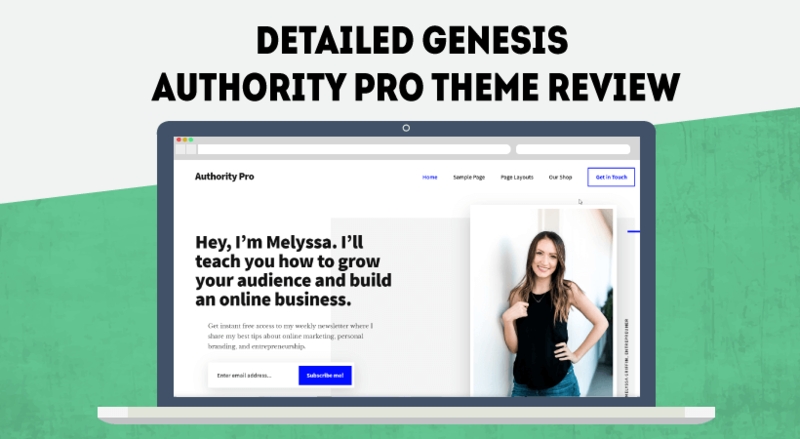 You can get the Genesis framework and the Authority Pro child theme for $129.95. This is a one-time purchase. You don’t have to pay again for updates. Additionally, the guys from StudioPress have an all in plan that will give you access to all of their child themes. The price for this is $499.95. Again, one-time payment. The second option is great if you’re a developer and you’re creating sites for clients. As for the individual price of the theme… Yes, it’s a bit more expensive than most of the themes we see on ThemeForest but it’s surely like nothing else you see on the market. Even though the theme has everything you need to have a great looking blog, there is something I don’t like about their themes: Some basic configurations are missing. For example, if you want to change the colors, or the fonts on the site, you need to go deep into CSS or HTML edits. If you don’t know how to do it, you need to install a couple of additional plugins to achieve that – like we did to add an email subscription box. Some of these plugins are even paid which will make the price of this theme higher. This theme is surely a piece of art. When you refresh your website once you’re finished, it will look like something that was created from an art director of a famous brand. All of this achieved in under a couple of hours. Still, as I mentioned, the theme itself lacks some really basic configuration options and if you don’t know a thing about HTML or CSS you will either spend hours learning how to do simple changes or pay more money for additional plugins. Well, you can simply leave things as they are, but still, I kind of miss some of the options. 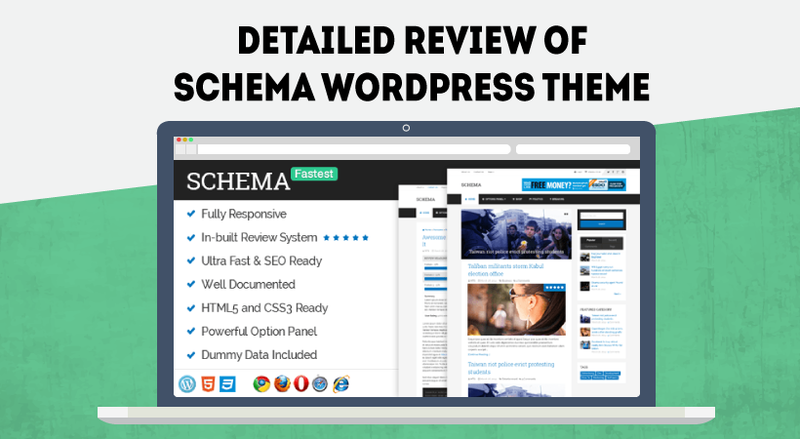 Detailed Review of Schema WordPress Theme – Is This Really The Fastest WordPress Theme?